OAKLAND, Calif. -- The Ghost Ship warehouse was home to many artists, musicians and creatives in Oakland. After a devastating fire that took the lives of at least 36 people, many from inside and outside the community have visited the site to pay their respects. Mourners have created memorial sites, leaving tokens of love and hope in memory of the victims. If you're viewing this story on the ABC7 News App, please click here to see the 360-degree photos. Below is a collection of 360-degree images of memorial sites near the scene of the fire near 31st Avenue and International Boulevard in Oakland. 31st Avenue and Fruitvale Avenue, Oakland, Calif. 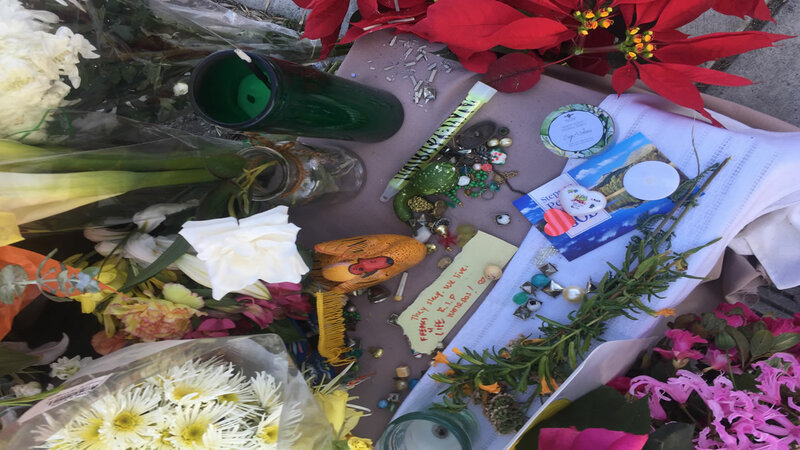 These sites are filled with handwritten messages, thoughts and memories of those who were lost in the Ghost Ship fire. This memorial appears at 31st Avenue and International Boulevard in Oakland. 31st Avenue and International Boulevard, Oakland, Calif. If you look closely you'll spot an artist with his easel, painting the scene of the Ghost Ship fire near a growing memorial site at the building's back. East 13th Street and Darby Street, Oakland Calif.
Tie-dye t-shirts, prayer candles and flowers line the street behind the Ghost Ship warehouse site near Darby Street near Oakland's Fruitvale shopping district. Click here for full coverage of the Ghost Ship fire.